The government has heightened security measures in an attempt to quell street protests. Five Cambodian land activists were arrested in the latest move by authorities to suppress street protests against the government of strongman premier Hun Sen, a rights group said. 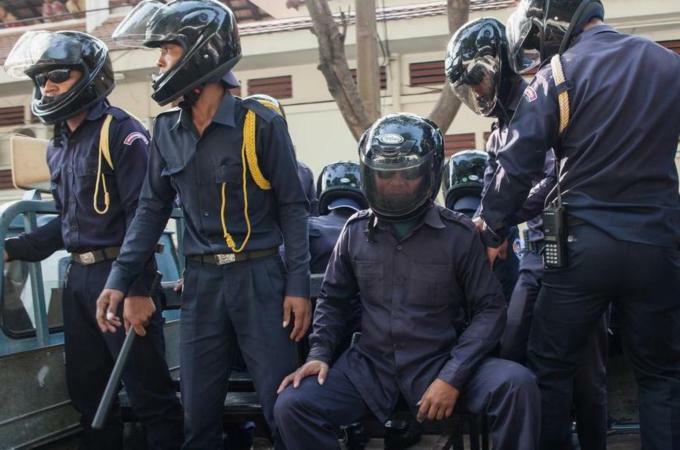 The five women were detained for hours and then released on Monday as they prepared to stage a rally in front of the French Embassy to call for the release of other imprisoned human rights defenders, the Cambodian League for the Promotion and Defense of Human Rights (LICADHO) said. The activists are from the Boeung Kak community, where thousands of families have been displaced to make way for a private development of a 220-acre lake, which has been filled in with sand, in the capital Phnom Penh. Hun Sen faces an increasing challenge to his nearly three-decade rule from striking garment workers as well as opposition supporters demanding that he step down and call a new election because of alleged vote fraud. Police have indefinitely banned further rallies after several demonstrators were shot dead on Friday. Cambodia National Rescue Party leader Sam Rainsy and his deputy Kem Sokha have been summoned to Phnom Penh Municipal Court on January 14 for questioning in connection with the recent unrest. LICADHO said those arrested on Monday included prominent activists Tep Vanny and Yorm Bopha, previously named a “prisoner of conscience” by Amnesty International. Yorm Bopha was freed from jail in November. She is awaiting a retrial for allegedly taking part in beating two men. Witnesses told AFP news agency that the activists were pushed into a van by plain-clothes police officers. Officials could not be reached for comment. LICADHO accused authorities of refusing to disclose the place of detention of at least 23 other people who were arrested and charged during the crackdowns in Phnom Penh last week. The opposition party has boycotted parliament since the July election, alleging that Hun Sen was returned to power because of widespread vote-rigging. The 61-year-old prime minister has ruled for 28 years and vowed to continue until he is 74.